Dogs, of course, aren’t concerned for themselves, but for us, their Giants. As socially cooperative pack animals, they long ago solved their health care challenges through a system of eating grass, then throwing up. Coincidentally, a similar measure for humans is being considered by Congress, although it would eliminate many grasslands and restrict where the insured could puke. Read more on our litter-mate blog, Sleeping between Giants. A holiday tradition! I’ve reposted this Independence Day Sleeping between Giants strip every year since 1776. Enjoy! As our Founding Fathers did. Subscribe to Sleeping between Giants, our litter-mate blog, and never miss another post. Unless I don’t write one. Budleigh and Brisby review the latest healthcare plan, because everyone gets sick and many have fur. Click the panel to read the entire comic strip at the new Sleeping between Giants blog! And subscribe to Sleeping between Giants so you never miss a post. Unless I don’t write one. 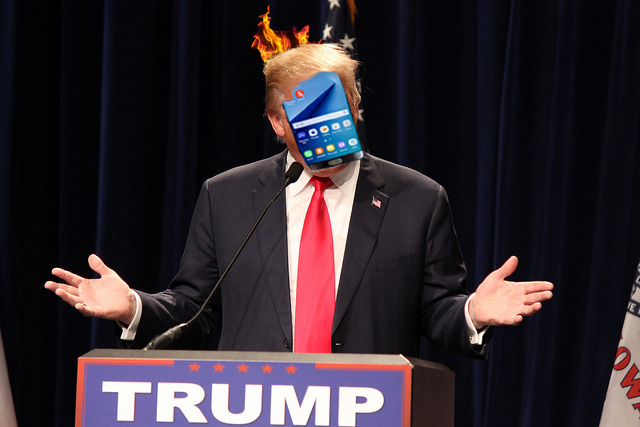 (WriteGood!TheNews wire service) — Highly volatile Donald Trump has been recalled by Samsung at the urging of GOP leaders who fear for the party’s safety. “Cynics charge that this action is merely to protect Republicans in tight House and Senate races,” said GOP Strategist and Fire Inspector Rocky ‘Ace’ Butane. “But it’s really for the safety of women and children. Volatile Donald Trump now poses safety threat to own private jet. South Korean industrial giant Samsung recently recalled their popular Galaxy 7 Note smartphones due to combusting batteries. But why the GOP would urge that company to recall Trump is unclear, except that South Korea “is really, really far away,” explained Butane. Republican vice presidential candidate Mike Pence was quick to defend his running mate, charging that Hillary Clinton repeatedly failed to deploy side impact air bags at speeds above 45 miles per hour. COMING SOON! Look for the premier of Sleeping between Giants, a blog that explores life – if you could call it that – with a terrier. Great fun for dogs that can read!